Proper ventilation in a crawl space and the installation of a vapor barrier over exposed soil in a crawl space are important to preserving the wood foundation and sub-flooring of your home. Wood damage in homes due to wood destroying fungus is a serious problem and causes approximately $1 billion in damage annually. 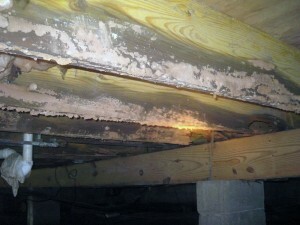 Expest offers a “Dual Approach” to reduce the risk of moisture damage in a crawl space. For crawlspace moisture reduction in unusual situations, Expest also offers the installation of the Power Temp Vent. This vent provides forced ventilation to non-ventilated areas and is controlled by an electric humidistat or thermostat. The installation of an Expest moisture barrier in the crawlspace will cause soil moisture to condense on the underside of the barrier and return to the soil. This reduces condensation on floor joists, sub-flooring and other structural timbers that lead to attack by wood-destroying insects. An Expest moisture barrier is professionally installed over 70% to 100% of the crawlspace, allowing wood to dry slowly, minimizing warping and cracking. Each barrier is made either 4 or 6-mil polyethylene and is available in non-transparent or transparent sheeting, a combination proven to provide protection over the years and reduce barrier deterioration. * The purpose of increased ventilation and reduction of moisture levels in a crawl space is for the elimination or control of wood destroying pests, such as wood destroying fungi, termites, wood boring beetles, and crawling bugs that are attracted to moisture. Moisture control is limited only to ventilation requirements and does not control moisture conditions caused by water leaks, leaky pipes, improper drainage of surface water, poor grading, or high water tables. The control, prevention, or elimination of surface molds or mildews is not the purpose of improved ventilation nor is there any implication of control or guarantee against molds or mildews.